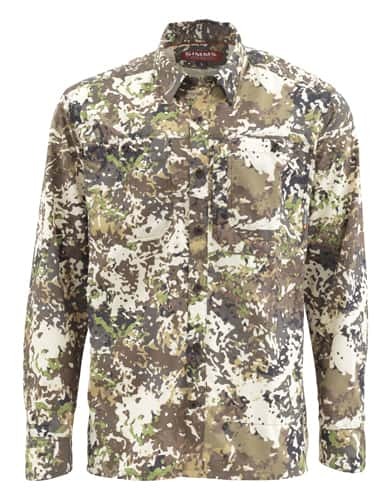 Simm lightweight Ebbtibe shirt now in river camo camouflage is fitted for clean, versatile living. This go-anywhere long-sleeve breathes easy, bucks moisture, and blocks sun with high-strength UPF50 protection. Features include fly box-compatible, hook-and-loop secure chest pockets, back venting, and extended cuffs for wrists in need of respite. EbbTide means the period between high tide and low tide during which water flows away from the shore. The receding or outgoing tide. The ebbtide period between high water and the succeeding low water. Typically game fishing during an ebbtide is poor as there is no current to move food.